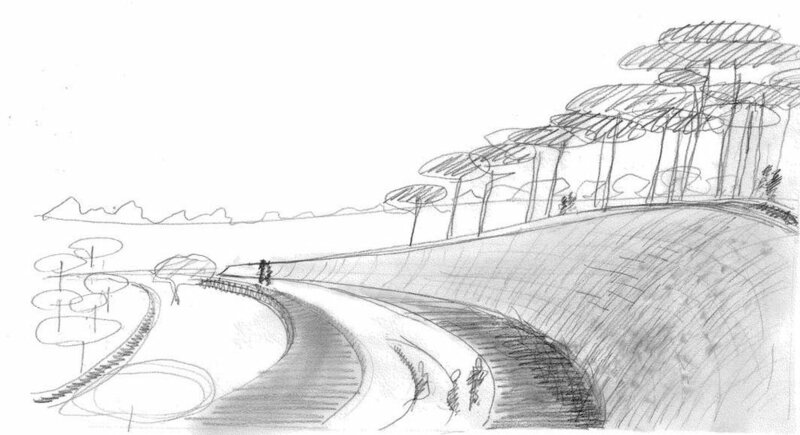 Our design is formed of a strong cut into the hillside of the park which holds back a hillside grove of Pine and Oak. The Memorial wall acts as an organisational feature that carefully guides the landscape environment that surrounds it. The wall protects a viewing terrace set above cultivated terraces of Olive, Mulberry and Citrus trees and its afternoon shadow will create a pleasant cool spot from which to pause and observe. By cutting the wall into the hillside, it reaches out within its surrounding context as a mark of attraction. The Memorial’s water terrace gives opportunities for reflection and contemplation. The causeway appears to float over the dark marble lined pool. On one side the water energetically ripples and splashes as it hits stone and water. On the other side its mirror like reflection of landscape and sky presents a calm floating presence. When the rill of water reaches the wall, the water is guided purposefully and playfully along channels set into its top surface, from here it is released over the walls surface before entering a pool which feeds channels that irrigate the planting terraces and feed a cascade. 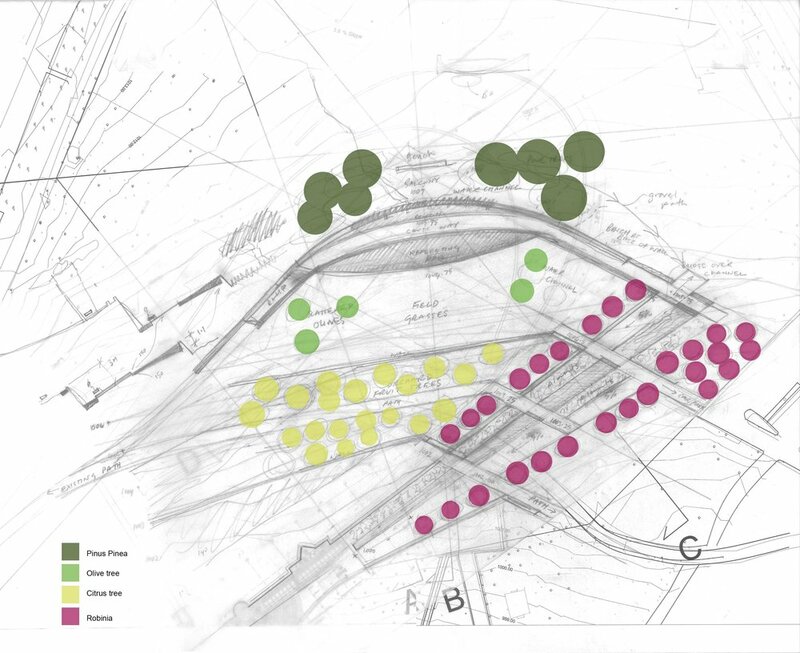 The park already has a strong infrastructure of paths, landscape events and environments, but the Promenade of Jordan remains incomplete without a major destination that concludes its axis. The Memorial distributes, connects and receives people visiting the park from new directions. 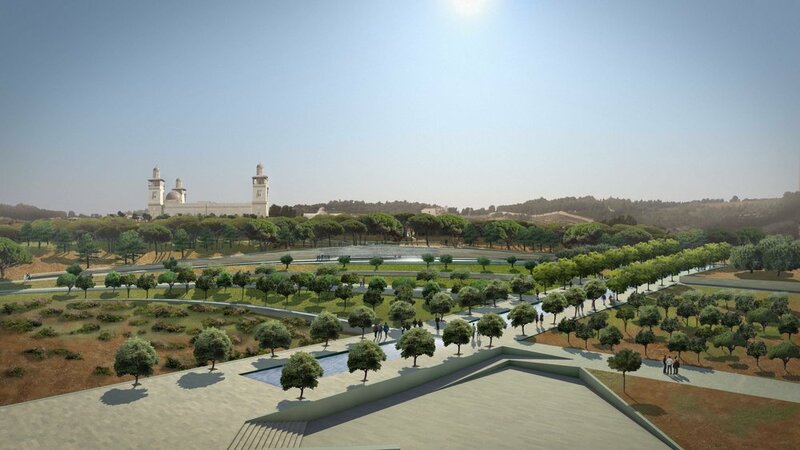 The Friday Mosque and Promenade of Jordan are finally connected, bringing people to the Memorial from both directions.